Article 19 at Altans trial. December 2017, Istanbul. On 13 November 2017, the judge in the trial of prominent writers, Ahmet Altan, Mehmet Altan and Nazlı Ilıcak dismissed the Altans’ entire defence team in an unprecedented blow to the right to a fair trial in Turkey. The Altans, who were not present in court but observed the proceedings via video link from Silivri prison, were forced to represent themselves in a blatant violation of their right to practical and effective legal assistance. ARTICLE 19, PEN International, PEN Norway and Reporters Without Borders (RSF) condemn this clear violation of fair trial rights and call for their immediate release, and for all charges to be dropped. The trial, in which the defendants are accused of “preparing the ground” for the failed coup in July 2016 on the basis of their criticism of the government, forms part of a wave of arrests and trials of thinkers, writers and journalists aiming to silence political dissent following the coup attempt. “This is the first time in 40 years as defence counsel that I have been expelled from court for trying to carry out my duty as a lawyer to defend my client,” said Ergin Cinmen, the head of the Altans’ defence team. He had argued that the defence had the right to see all of the evidence against their clients prior to the prosecutor presenting his final sentencing opinion. After his expulsion by the judge, the three other defence lawyers for the Altans were subsequently expelled from the court by the judge after requesting he recuse himself on the basis of manifest impartiality. The judge rejected their right to speak and upon their protest, ejected them from the court for the rest of the day’s hearing. In the absence of their defence lawyers, the Altans requested their release on bail but this was once again rejected. Ilıcak’s request for release was also denied. At the interim decision, the judge also admitted the Parliament of Turkey as a co-plaintiff against the journalists. The Altans are charged with attempting to overthrow the constitution, the parliament and the government through violence or force, while the evidence presented consists of their expression. 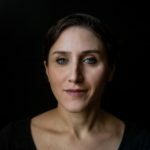 These charges are considered “catalogue crimes” in Turkey, which means that defendants are held in pre-trial detention without consideration of flight risk. The Supreme Court of Appeals of Turkey ruled in another case on 14 July 2017 that these charges require the elements of violence and force to be present and cannot consist of expression alone, without proof that the defendant had prior knowledge of the crime, in this case the coup attempt, and was acting under orders of a terrorist organisation. In a further concerning development, the prosecutor in the case has recently been changed. 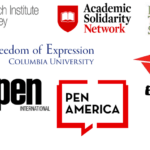 “The fact that the composition of the court keeps changing is another violation of due process,” said Burhan Sönmez, Board Member of PEN International. “The judge in the case has in his treatment of the defence counsel and the defendants consistently demonstrated his bias against them,” said Pierre Haski, President of RSF. 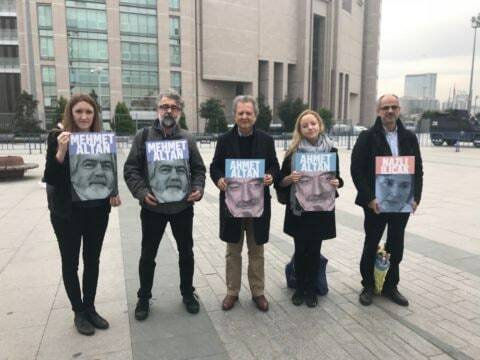 “The Altan brothers and Ilıcak are being tried purely on the basis of the exercise of their right to freedom of expression and must be immediately released”; said Katie Morris, Head of Europe and Central Asia Programme at ARTICLE 19, “The denial of their right to a fair trial by Turkey’s judicial system demonstrates the heavy price that Turkish journalists and writers pay for doing their work and undoubtedly has a chilling effect on expression more widely in the country”. Ahmet and Mehmet Altan and Nazlı Ilıcak are also still subjected to extraordinary restrictions in their access to lawyers who they are only allowed to meet with once a week under surveillance. ARTICLE 19, PEN International, PEN Norway and RSF jointly intervened as third parties in the Altans and Ilicak cases before the European Court of Human Rights outlining the implications of the case for freedom of expression under the ongoing State of Emergency in Turkey. ARTICLE 19 also submitted an expert opinion in the case at the domestic level at the opening hearing in June. For further details please contact Sarah Clarke, Advocacy Manager on [email protected] +44 75757 030028.